What is the land which is subject of the “Eh da”-initiative? “Eh da” is a Southern German idiom which means something like “anyway available” or “at hand but unplanned”. Accordingly, Eh da-areas are generally available and have space for ecological optimization. “Eh da-land is open land in agricultural landscapes and small settlements which is not used for economy, agriculture, gardening, and which is not included in nature conservation programs”. Such areas are often found along traffic ways - waysides, slopes, embankments-, there are dams, banks, and there may be communal lawn or different other kinds of unmanaged plots. Many of these areas are longitudinal and follow traffic ways, some are more compact, and together they form a network which crosses through many agricultural landscapes. A GIS-analysis of several German landscapes showed that there is a considerable amount of land, depending on local conditions, which falls under this definition. Eh da -area may be in the range of 2-5 % of agricultural landscapes. These areas provide important biotopes for many plants and animals, and they are often corridors which are used for migratory animals and for gene flow between isolated populations of animals and plants. Eh da-projects have the goal to manage these areas in order to improve the resources for bees. In Germany, there are about 560 bee species. There is increasing scientific evidence that the honeybee is not the only important pollinator, instead, the total pollinator community including wild bees and other flower-visiting insects is the provider of this “ecosystem service”. Many wild bee species declined drastically during the last decades in agricultural landscapes, and they need protection which considers their often very specific breeding and foraging requirements. - Many wild bees need combined biotopes, i.e. floral resources and nesting habitats must be in vicinity. Forage distances of wild bees are often in the range of 200-300 m, opposite to the honeybee which may fly several kilometers to find feed. - Local conditions play an important role, for instance soil characteristics which determine the suitability for nesting of wild bees. - Structural diversity of landscapes in which Eh da-initiatives are embedded needs to be considered. Again, GIS-analyses of local conditions are helpful tools for planning. 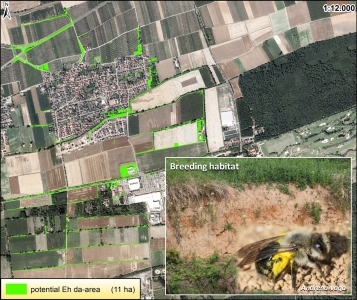 When there are gardens and flower-reach vegetation, Eh da-areas may provide breeding habitats or, vice versa, when wild bees are nesting in quarries or gravel-pits, additional forage may be provided. Any Eh-da initiative needs teamwork. As above mentioned, it is more than a package of isolated biotope management actions. Experiences show the importance of local communities including council and major are key actors. An Eh da-initiative integrates farmers, beekeepers, nature conservationists, and citizens who have interest in the protection of bees which are an attractive, economically and ecologically highly relevant element of biodiversity.